An automated parking management system is a technique for mechanically parking and retrieving vehicles in order to accommodate the increase in demand for safe and convenient parking, as the number of vehicles increase day by day. In an automated parking management system, the driver parks the vehicle at the entry gate of the parking area, and from there, the vehicle is automatically moved through the parking lot and parked in an available parking space. The process of vehicle parking is carried out through robotics arms, sensors, conveyer belts, mechanical lifts, and computer control units. An electronic data transfer bus is used to transport from arrival level to parking space and vice versa, without any human interference for parking assistance. Automated parking management systems reduce the width and depth required for a parking space and distances between vehicle parking spaces, since no allowance needs to be made for driving the car into the parking space or for the opening of vehicle doors. Furthermore, no driving lanes or ramps are required to drive the vehicle toward the parking place. The ceiling height required is minimal, since there is no pedestrian traffic in the parking area. Furthermore, no walkways, stairways, or elevators are required to accommodate pedestrians in the parking area. These advantages are key drivers of the automated parking management system market. There is a general global trend of urbanization and centralization of financial districts, which attract a number of people to downtown areas. This continuously increasing influx of people gives rise to an ever rising need for parking spaces. Automated parking management systems are used to park vehicles automatically in parking spaces, which reduces human error in parking. They also reduce the time required for people to look for parking space in the parking lot. These beneficial applications of automated parking systems are likely to boost their demand, especially in suburban areas and financial districts. 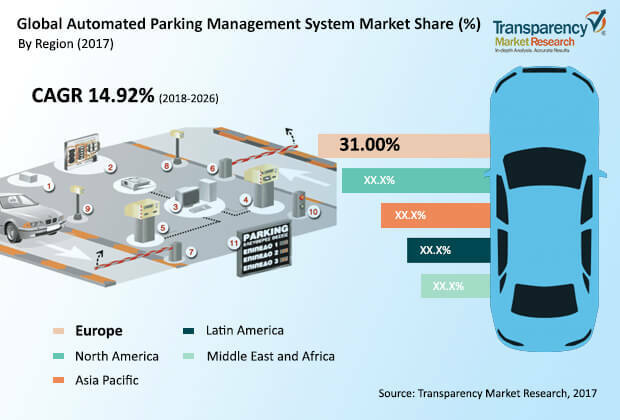 The global automated parking management system market is projected to expand at a CAGR of more than 13.00% between 2018 and 2026. The semi-automated parking system segment is projected to hold a prominent share of the market in 2017. Semi-automated is an old tried and proven technology with low manufacturing cost that is widely used in passenger vehicles. In terms of technology, the market can be segmented into sensor technology, mobile technology, RFID technology, and other technology. Demand for sensor technology is anticipated to increase significantly during the forecast period due to rapid industrialization in suburban areas and rise in technological advancements in automated parking management systems in the global market. Some of the prominent regions taken into consideration for the analysis of the automated parking management systems market are North America, Europe, Asia Pacific, Middle East & Africa, and Latin America. The region-wise analysis is done on the basis of revenue generation trend, city development, and regulation changes. The automated parking industry in North America and Asia Pacific has been observing significant developments in the last few years due to the emerging economic conditions, rise in number of financial districts, increase in smart city development, and rise in urbanization in metropolitan cities. Key players operating in the automated parking management system market are anticipated to benefit from mergers and acquisitions with global players in the differential market. Key market players have a strong global presence, firm establishments, and a wide product portfolio. The players operating in the automated parking management system market are Skyline Parking AG, CityLift, Robotic Parking Systems, Inc., UNITRONICS, Dayang Parking Co. Ltd., EITO&GLOBAL INC., and others. Companies are focusing on strategic expansions with regional parking system providers in order to expand their business globally. Skyline Parking AG is a major manufacturer and has expertise in the manufacture of fully and semi-automated parking systems. Skyline Parking AG holds a prominent market share in the automated parking management system market.